At a press conference Tuesday following a two-day summit of the Association of South East Asian Nations (ASEAN) held in California, President Barack Obama was confronted with a question about his administration’s intentions with regard to the escalating war in Syria. Reflecting a growing drumbeat of criticism from Republicans and sections of the US foreign policy establishment, the reporter asked whether Obama had been “outfoxed” by Russian President Vladimir Putin. Noting that Russia’s military intervention in Syria had helped turn the tide of battle in favor of Syrian President Bashar al-Assad against the Western-backed “rebels,” the reporter asked whether Washington would “step up military action” in support of the Islamist militias it is backing if the city of Aleppo fell to the government offensive. Obama’s reply was a study in imperialist hypocrisy, deceit and historical falsification. Insisting, “This is not a contest between me and Putin,” the US president set out to prove that Putin was not winning. The result, he further argued, would be Russia’s finding itself “in a quagmire,” compelled to invest in “a permanent occupation of Syria,” which would “not be the best thing for Russia,” given the state of its economy. 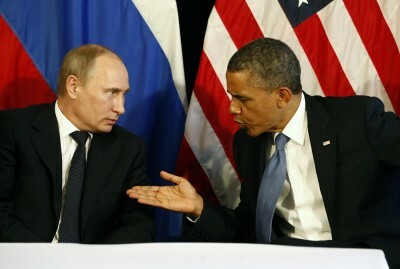 One is prompted to ask, who is Obama to lecture Putin? But in the end, one has to acknowledge that if anyone knows whereof he speaks on questions of quagmires and permanent occupations, it is the president of the United States. Just last October, Obama reneged on his pledge to withdraw all US troops from Afghanistan before the end of his presidency in January 2017. Ten thousand US soldiers remain deployed there, nearly 15 years after the US invaded the country in 2001. US commanders have indicated they may ask for that number to be increased in the face of a mounting insurgency against the puppet government installed by Washington. The regime in Kabul, it can truly be said, lacks legitimacy and remains in power solely thanks to the US troops propping it up. It is a similar story in Iraq, which the US invaded in 2003, toppling its government, devastating its society and causing the deaths of an estimated one million men, women and children. Roughly 4,000 US troops are back in Iraq following the ignominious June 2014 collapse of the puppet forces the US armed and trained, at the cost of some $24 billion, in the face of an offensive by the Islamic State of Iraq and Syria (ISIS). The number of US troops—which does not count another 2,500 deployed across the border in Kuwait and some 7,000 private military contractors—is expected to climb. If there is a “quagmire” in the Middle East, it is of Washington’s creation, the product of unending wars for regime change aimed at imposing US hegemony over the region and its vast energy resources. Syria is an integral part of this process. Obama feigned deep concern over the fate of the Syrian people, insisting that it is their welfare, not some filthy imperialist intrigue, that motivates Washington’s actions. “The question is, how can we stop the suffering, stabilize the region, stop this massive out-migration of refugees who are having such a terrible time, end the violence, stop the bombing of schools and hospitals and innocent civilians, stop creating a safe haven for ISIS,” he said. As Obama was speaking, there was a report from Syria that a US warplane had struck a bakery in a Syrian town near the Iraqi border, killing 15 people standing in line for bread in the early morning. Moscow, meanwhile, has rejected charges that it was responsible for the bombing of schools and hospitals the day before, while the Syrian government has charged that an American air strike inflicted the worst of the casualties. Whatever the ratio of civilian deaths caused by US versus Russian airstrikes, the undeniable fact is that the suffering of the Syrian people is the product of a concerted drive by the US, NATO and Washington’s Middle East allies to topple the government of Assad and impose a puppet regime more subservient to Western interests. To that end, a vast operation was mounted in which the CIA, working with Saudi Arabia, Qatar and Turkey, organized the funding and arming of Islamist militias linked to Al Qaeda and funneled tens of thousands of foreign fighters into Syria to wage a vicious sectarian war for regime change. The results of this criminal enterprise are the deaths of some 300,000 Syrians, with another 11 million turned into homeless refugees. That Russia may become trapped in the Middle East quagmire created by decades of US military aggression is not excluded. The Putin government, representing the interests of the capitalist oligarchy that arose through the criminal appropriation of state property following the Stalinist bureaucracy’s dissolution of the Soviet Union, is intervening in Syria not out of altruistic concerns for the Syrian people, but for what it sees as the oligarchy’s own interests. It fears that the toppling of Assad by US-backed Islamists will not only deprive Moscow of its only close ally in the Middle East, but also pave the way for a more concerted drive to isolate, weaken and ultimately dismember the Russian federation. A US puppet in Damascus would open the way to pipeline routes for Qatari gas and Saudi oil bound for Europe, undermining the foundation of the Russian economy. At the same time, the Islamist forces utilized in Syria could be unleashed on the North Caucasus, exploiting the resentments of the local population toward the repression carried out by Moscow. Meanwhile, the danger of a full-scale military confrontation in Syria between the US and Russia, the world’s two major nuclear powers, continues to grow, with Washington’s allies, Turkey and Saudi Arabia, seeking to provoke such a clash as a means of furthering their own regional and domestic political interests. For its part, US imperialism, whatever the immediate tactical calculations of the Obama administration, will be driven by the setbacks it has suffered in Syria and, more fundamentally, the deepening crisis of American capitalism to ever more brutal and reckless acts of military aggression and violence.